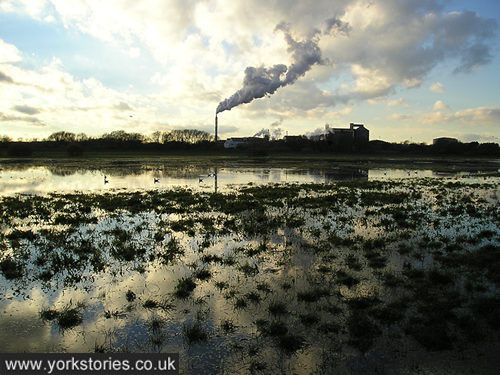 The factory so well known to York folk, with its landmark chimney, pictured over a flooded ings, in its last ‘campaign’. As well as giving employment to so many people, for decades it gave a distinctive odour to our autumn and winter air. As mentioned previously on this site – a few times. The photo above was included on a page from 26 November 2006. Five years on, do you miss it? Lovely picture – but my abiding memory is of the seasonal hazard for cyclists when an overloaded lorry pulled up a bit sharp in front of you – and beets the size of cannonballs tumbled off into your path! I have an abiding memory of seeing beets lying in the gutters on Beckfield Lane – but had never really thought about the hazards they presented on their way down! My sugar beat memory, is of my Uncle Frank,coming in the house at Ouseburn Ave,where I ‘’holidayed’’ pre war,and my Cousin Beryl and I used to rush to greet him home,burying our face in his clothes,to smell the lovely sweet smell he emenated,after a shift at his work as foreman at the beet factory.Happy Happy days! PS.Sugar beat as in River ooze. I remember sometime in the 90s there was some kind of chemical accident at the sugar factory which caused a smell all over the city of York in summer. Can you pease tell me when this was and what caused the accident. Hi Grace, sorry but I don’t remember this, perhaps someone else will though.